The truth is not subjective—it is objective. At the heart of the Holy Spirit’s work is this reality: God can be denied, ignored, and ridiculed; but come Judgment Day He cannot be avoided. The Holy Spirit calls us to live holy lives and provides the ability to do so and thus overcome the temptations of the world. The clamor of the world may deafen the spirit of truth within but cannot drown it out. 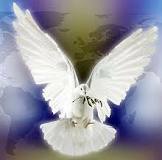 Today may very well be the day the Holy Spirit seeks to be heard. Are we willing to listen? Jesus had so much to teach but knew that in our frail human capacity, it would be too much. Imagine the treasures of Christ! When we are ready to explore those treasures, the Holy Spirit will be our guide. When we are ready to listen we will be overwhelmed by God’s love and the truths of His Son. This will all come from listening to the Holy Spirit who resides within—as promised. The Holy Spirit is the greatest teacher of all! He teaches the things that will lead to salvation and eternal life if only He has a willing student. Today commit to being a student of the Holy Spirit and be forever changed!